This week was our first anniversary of living in the UK! I am now conversational in Yorkshire, know that jelly is Jell-O and a Ariel isn’t just the Little Mermaid, it’s also a car’s antenna. I look right first when crossing the street and can navigate roundabouts on my bike. My love affair with old British houses had only become more passionate with time and sometimes I even eat beans on toast. It’s funny what living abroad can do to your sense of belonging… I know I don’t belong in the UK but then I also start worrying that I won’t feel at home in the US either. I think whenever you’re living abroad it’s all too easy to idealize your homeland. Nostalgia is a powerful thing. Somehow I always picture DC as sunny and with the cherry blossoms in full bloom. But then I get paranoid because I know the US is far from perfect. Nevertheless, something about being abroad makes you want to defend your country from criticism. Like when you’re little, it’s ok for you to complain about your mom but as soon as your friend makes the slightest negative remark about her, you come rushing to her defense. And when people ask you – “What’s blank like in the States?” or “How do they do so-and-so where you’re from?” how can you answer? There’s such diversity and differences even within my own homeland. And yet I’m constantly comparing the UK and US… trying to make sense of who I am and how my culture has shaped me. It’s hard to know where “home” is, and harder still to realise whenever you return it will have changed. But then, perhaps belonging isn’t about a place. Regardless of location it’s good to know that Dan & I belong together. And I guess when it comes down to it, perhaps I don’t feel at home on this earth because I’m a citizen of another kingdom. No, not doing things differently, money in coins. They have a ƒ.1 coin, a .ƒ02 coin, a .ƒ05, ƒ.10, ƒ.20, ƒ.50, ƒ1 and ƒ2 coin! The smallest bill you can get in pounds is 5 – that’s $10 USD! My pockets jingle like never before! WOW! You need a 10 minute talk about health and safety before you’re even allowed to make a cup of tea in the UK! They are heath and safetey kings (or should I say queens?). At least here I’m safe as ‘ouses. Smile! You’re on CCTV camera! There are CCTV’s everywhere! I know it’s supposed to make us feel safer but it’s a bit creepy. Got to love this by Banksy. More musings of an American in England… this time fun differences in linguistics. And dear foreigners BEWARE of showing your British friends your nice new —– pack as the word is not so polite in the UK. 10. Gorgeous gardens – at least all the rain makes the flowers and plants happy! 7. All the charity shops (a.k.a. thrift stores). They are everywhere and you can find some steller buys. 6. Public footpaths – a enormous network of paths that may go throw private land but are open to the public – a hiker’s heaven! 5. Cider on tap! Yay Strongbow! 2. Ryan Air, Easy Jet, etc. Fly practically anywhere in Europe & a few other great destination as well for as little as £0.01 – yes please! Today you’re in for a treat – a virtual tour of Haddenham, the village where we’re currently living. First off, pronunciation. Basically, just forget the whole middle bit – and say it: “Had – Nam.” In fact, we like to just call in ‘Nam for short. Haddenham is in Buckinghamshire, about an hour east of Oxford. It has over 5,000 residents, many of whom claim Haddenham is the largest village in England. (But it not.) It is old. And beautiful. The Anglican church, St. Mary’s, was built in the 11th century! 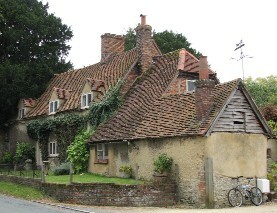 Haddenham is known for its “witchert” houses and walls. Witchert is basically a fancy name for old mud – but they do make it pretty! There’s a lot of darling cottages with thatched roofs in the village. Haddenham has a butchers, a bakers and… well, to be honest there’s no candlestick makers… but there is St. Tiggywinkles – a wildlife hospital! There are also 4 churches, 5 pubs (hmm…), a fantastic Indian restaurant and a train station that gets you to London in under an hour. And, this year Haddenham was awarded “Best Kept Village” again. Wow! And for the next few months, Haddenham is home! Whilst it may be true that people in the States & England both speak English let me tell you there are LOADS of differences between the two tongues. There’s the classic “pants” (underwear in the States, trousers in England) and there there’s fun grammatical differences (“math” in the States & “maths” in the UK) and the different pronunciations (tomato, aluminum). Plus the Daddy Long-legs in England fly!! And, there’s no such thing as a “British accent” since really there’s about 32 different accents that Brits have. Anyow, for all you Americans out there, I have a wee little paragraph in British slang…how much are you able to decipher? Oi! I was at a chippie with me mates and they pressurized me to have a butcher at this banger on offer. So I is bought it and we pegged it off, with the bonnet narrowly missing a HGV, but we was safe as houses, innit. So we went out on the raz and I pulled a fit ginger bird. She’s brilliant at maths and sport, especially footie. So we have arrived safe & sound in England, albeit a day late. Our first flight was cancelled. Well actually it was delayed, then cancelled, then not cancelled and then cancelled again. Yeah, it was a bit ridiculous. But now we’re here and getting all settled into the darling house in Haddenham. Despite being unemployed we’ve been busy catching up with friends and family and getting phones & bank accounts & such. We’re also looking for jobs…. if you know of any needed graphic design or editing work let us know. And we’re exploring some possible part-time work… perhaps at an organic cafe or a snazzy kitchen shop or as a cleaner. In fact, Dan already has two weeks lined up working for SoundAbout, a cool charity for disabled children his mum works for.